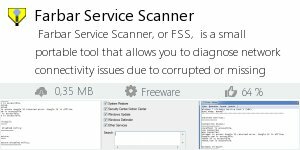 Farbar Service Scanner, or FSS, is a small portable tool that allows you to diagnose network connectivity issues due to corrupted or missing Windows services. Certain malware, such as TDSS, may delete or corrupt Windows services, which would cause your computer to no longer have network connectivity. When FSS is run it will display a detailed report on the services, driver services, their configurations and the files that are responsible for network connectivity. Using this information a user can diagnose issues with their network connectivty as well as other Microsoft services.